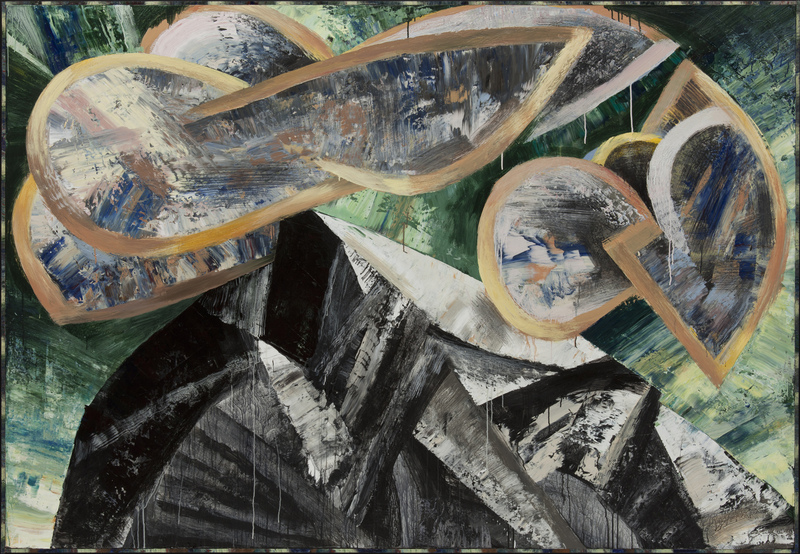 Convergence is a collaborative exhibit between two Oregon artists, Lee Imonen and Lucinda Parker. 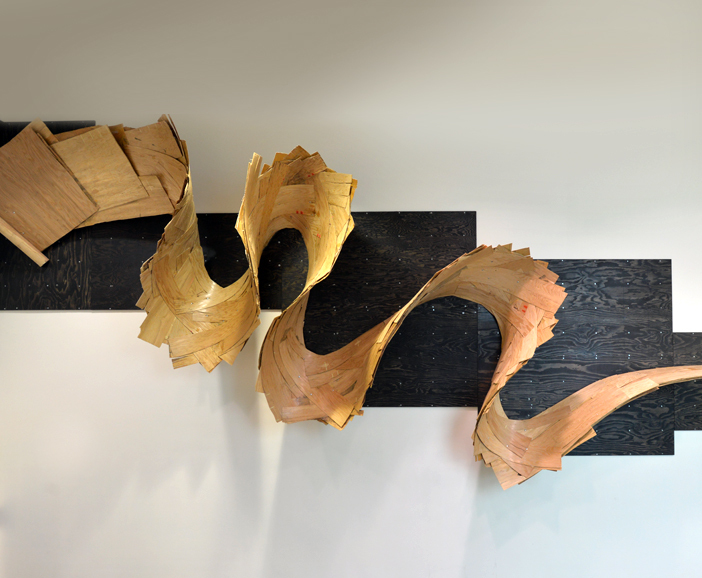 Developed as a sculptural response to Lucindaʼs painting Sunshine Route, Leeʼs 40′ long sculpture, 9-Ply (shown above), brings into three dimensions the painting’s sweeping fluidity while contrasting the hard-edged background. Lucindaʼs bold, abstract work is inspired by the natural landscape. With aggressive and definitive strokes, she builds texture through layers that mimic sculptural form. Leeʼs work addresses the life cycle of our natural resources – from the creation of finished products to their end-of-life recycling. Beginning as a fir peeler core, 9-Ply unravels to wind its way across the wall, becoming more and more deliberate in its layering, while finally resulting in a standard sheet of 9-layer plywood crafted into a finished cube. At a deeper level, this is the story of industry in the northwest, of the importance of managing our resources sustainably, and a recognition that our lives and comfort depend on these resources on a daily basis. These often overlooked or overly simplified relationships of resource dependence surround us at all levels, and are integral to the world we live in. Lee Imonen is a sculptor and designer living in Eugene, OR. A partner in the IMONALI DESIGN team, his work focuses on the relationship between people and the objects with which they surround themselves. Lee Imonen extends special thanks to Roseburg Forest Products for their partnership in creating 9-Ply. Lucinda Parker is a painter living in Portland, Oregon. Lucinda received a BA jointly from Reed College and Pacific Northwest College of Art in Portland and an MFA from Pratt Institute in New York. Her work has been shown and collected nationally. Locally, Lucinda is represented by Laura Russo Gallery.